Gene silencing of the repair genes MLH1 and MGMT was shown to be a mechanism underlying the development of microsatellite instability (MSI), a phenotype frequently associated with various human malignancies. Recently, aberrant methylation of MLH1, MGMT and MSI were shown to be associated with mutations in genes such as BRAF, RAS and IDH1 in colon and brain tumours. Little is known about the methylation status of MLH1 and MGMT in thyroid tumours and its association with MSI and mutational status. In a series of 96 thyroid tumours whose mutational profiles of BRAF, IDH1 and NRAS mutations and RET/PTC were previously determined, we investigated MLH1 and MGMT expression and methylation status by qPCR and methylation-specific PCR after bisulphite treatment, respectively. MSI was determined by PCR using seven standard microsatellite markers. Samples with point mutations (BRAF, IDH1 and NRAS) show a decrease in MLH1 expression when compared to negative samples. Additionally, malignant lesions show a higher MSI pattern than benign lesions. The MSI phenotype was also associated with down-regulation of MLH1. The results of this study allow us to conclude that low expression of MLH1 is associated with BRAF V600E mutations, RET/PTC rearrangements and transitions (IDH1 and NRAS) in patients with thyroid carcinoma. In addition, a significant relationship between MSI status and histological subtypes was found. Thyroid cancer is the most common type of endocrine cancer. Its worldwide incidence has more than doubled since the 1970s. In fact, thyroid http://cancer is the fastest-growing number of new cancer cases in women . Papillary Thyroid Carcinoma (PTC) is the most common subtype, representing approximately 80% of cases. Follicular Thyroid Carcinoma (FTC) is the second most prevalent subtype, accounting for 10-15% of thyroid cancers [1–4]. Multiple genetic and epigenetic alterations have been described in thyroid cancers in recent decades. Most mutations involve effectors of the mitogen-activated protein kinase (MAPK) and phosphatidylinositol 3-kinase (PI3K) pathways. Mutations in RET/PTC, RAS, or BRAF, which result in constitutive MAPK signalling, are found in approximately 70% of PTC cases with little overlap between mutated genes. BRAF V600E is the most common genetic alteration found in PTC, with a worldwide prevalence of 29 to 83% [5–9]. RET/PTC rearrangements are the second most common genetic alteration found in PTC. A highly variable rate of RET/PTC rearrangement has been reported in different studies; the rate ranges from as low as 0% to as high as 87% [10, 11]. Genetic alterations in the PI3K/Akt pathway are more commonly found in the genesis and progression of FTC. PIK3CA mutations and amplification were found in FTC. Additionally, PI3K can be activated through genetic or epigenetic inactivation of PTEN. Finally, the PI3K pathway can be activated through acquisition of RAS or PAX8/PPAR gamma mutations. We have previously reported that the BRAF V600E mutation occurs in approximately 48% of PTC cases [7, 8]. RET/PTC rearrangements were found in nearly 45% of PTC cases in Brazil (submitted). PIK3CA and RAS mutations were rarely found in our series . Recently, our group  and others [13, 14] described mutations in the IDH1 (isocitrate dehydrogenase 1) gene; these mutations were mainly associated with the pathogenesis of the follicular variant of PTC (FVPTC) and FTC but were rarely found in classical PTC. Microsatellite instability (MSI), caused by defects in the mismatch repair pathway, is a phenotype frequently associated with various human malignancies. Interestingly, promoter hypermethylation of the mismatch repair gene Human Mut-L Homologue 1 (MLH1) was previously associated with MSI and the presence BRAF V600E mutations in colon cancer . Additionally, hypermethylation of O6-methylguanine DNA methyltransferase (MGMT), a DNA repair protein that prevents G:C > A:T point mutations by removing alkyl adducts from the O6 position of guanine, may lead to IDH1 and RAS mutations in gliomas. Others have described that loss of MGMT expression may lead to PIK3CA mutations . Whether promoter hypermethylation of the MLH1 and MGMT genes is the underlying mechanism associated with presence of BRAF V600E, RAS, IDH1, PIK3CA mutations and/or other genetic alterations found in thyroid tumours is still unknown. In this study, we investigated the methylation status of MLH1 in a series of benign and malignant thyroid lesions. We next correlated MLH1 methylation status with expression of MLH1, MSI and mutational status. Additionally, as most IDH1 and RAS mutations found in our series of thyroid carcinomas were transitions  and considering that an association between MGMT and transitions exists, we assessed whether the presence of IDH1 and RAS mutations is associated with MGMT methylation and/or loss of MGMT expression. A total of 96 thyroid tissue samples obtained from patients who underwent thyroid surgery for thyroid cancer at Hospital São Paulo, Universidade Federal de São Paulo and Hospital das Clínicas, Universidade Estadual de São Paulo was used in this study. All tissue samples were obtained with informed consent according to established human studies protocols at Federal University of São Paulo (protocol 1259/11). To enrich the samples for tumour cells, tissue specimens were obtained from the central part of the tumour specimens. This strategy avoids contamination with surrounding normal tissue and allows for proper pathological diagnosis. Specimens were frozen in liquid nitrogen immediately after surgical resection and stored at −80°C. Final histological classification was obtained from paraffin-embedded sections. The study included 70 PTCs, 12 FTCs, 7 benign follicular thyroid adenomas (FTAs) and 7 adjacent normal thyroid tissues. All samples were previously tested for BRAF, NRAS and IDH1 mutations [7, 8, 12]. RET/PTC rearrangements were investigated in 56 PTC samples for which RNA was available (submitted). For MLH1 and MGMT expression analysis, total RNA was isolated using Trizol reagent as described previously (Invitrogen Corporation, Carlsbad, CA, USA) . RNA isolation and cDNA synthesis were performed as previously reported [16, 17]. Aliquots of 1 μL of cDNA were used in 12-μL reactions containing SYBR® Green Master Mix (PE Applied Biosystems, Foster City, CA) and 200–250 nM of each primer for the target genes and reference gene (RPS8), as described previously . The primer sequences are described in Table 1. The reactions were performed in triplicate using a 7500 Real-Time PCR System (PE Applied Biosystems). The threshold cycle (Ct) for each reaction was obtained using Applied Biosystems Software, and the values were averaged (SD ≤ 1). The PCR efficiencies for RPS8, MLH1, and MGMT were 1.0, 0.99 and 1.0, respectively (data not shown). As PCR efficiencies were comparable, relative expression levels were calculated according to the 2−∆∆CT (ddCt formula) as described previously [8, 17]. A portion of each tissue was used for the extraction of genomic DNA, which was performed using an adapted phenol-chloroform procedure. One microgram of DNA was treated with sodium bisulphite to convert cytosine to uracil using the EpiTect® Bisulfite kit (QIAGEN, Valencia, CA, USA) according to the manufacturer's recommendations. Briefly, the conversion was made using the following thermal profile: 5 minutes at 95°C, 25 minutes at 60°C, 5 minutes at 95°C, 85 minutes at 60°C, 5 minutes at 95°C, 175 minutes at 60°C and storage at 20°C. The DNA samples were purified, and bisulphite-treated DNA was resuspended in 30 μL of elution buffer for gene methylation analysis. DNA methylation was detected using methylation–specific PCR (MSP) performed with a primer set specific to the methylated or un-methylated sequence (M or U sets, respectively) . The PCR reactions were performed in a final volume of 25 μL, containing approximately 200 ng of sodium bisulphite-treated DNA and 25 pmol of each primer. The PCR amplifications were performed for 30 cycles and consisted of a denaturation step of 95°C for 5 min, a primer-annealing step of 58°C for 35 sec and an extension step at 72°C for 40 sec, with a single final extension step of 72°C for 7 min. The reaction products were separated by electrophoresis on 8% polyacrylamide gels and visualised by silver staining. We analysed the microsatellite instability pattern using 7 standard microsatellite markers, of which 3 were mononucleotide repeats (BAT25, BAT26 and BAT40) and 4 were dinucleotide repeats (D2S123, D11S912, D2S346 and D17S250). The MSI analysis was performed by PCR using specific primers (Table 1). PCR was carried out in a total volume of 20 μL, containing 200 ng of DNA, 2.5 μL of 10X PCR Buffer, 1 μM primer, 1.5-2.0 mM MgCl2, 200 μM dNTPs and 0.5 U of Taq polymerase (Invitrogen); the products were amplified by 1 cycle of 95°C for 5 min followed by 35 cycles of 95°C for 30 s, 55–58°C for 30 s and 72°C for 15 s, with a final extension at 72°C for 1 min. After the reaction, the samples were denatured using single-strand conformation polymorphism (SSCP) by heating at 95°C for 10 min, and gel electrophoresis was performed on the PCR-amplified products using a 6% polyacrylamide gel containing 6 M urea. To assess MSI, we compared the band pattern produced after gel electrophoresis of paired PCR reactions containing patient-matched normal and tumour DNA. If the normal and tumour (benign or malignant) PCR amplification products displayed different electrophoretic motilities, the case was scored as positive for MSI. Samples showing instability at one locus were scored as MSI-Low (MSI-L), and those showing instability at two or more loci were scored as MSI-High (MSI-H). Categorical data were summarised using frequencies and percentages. The relationship between the mutation, methylation and MSI statuses in PTC, FTC or benign subgroups was determined using Fisher’s exact test. Statistical analysis was performed within each subgroup. For expression analysis, normality was verified using the Shapiro-Wilk normality test. Because the data were not normally distributed, non-parametric statistics were used. A Mann–Whitney test was performed to evaluate the relationship between the expression of MLH1 or MGMT and mutational status (mutant or wild-type) and to evaluate the relationship between MSI or MSS in PTC, FTC or benign subgroups. P values <0.05 were considered significant. The SPSS software (version 11.5; SPSS Inc., Chicago, IL, USA) was used for data analysis. Of the 82 malignant samples, a BRAF V600E mutation was observed in 29 of 70 (41%) PTC samples. No BRAF V600E mutations were found in the 12 FTC samples (0%). RET/PTC was observed in 25 of 56 (45%) PTC samples. IDH1 mutations were observed in 5 of 70 (7%) PTC samples and 4 of 12 (33%) FTC samples. NRAS mutations were observed in 3 of 70 (4%) PTC samples and 3 of 12 (25%) FTC samples. No mutations were found in the benign group. In this study, the promoter methylation patterns of two DNA repair genes, MHL1 and MGMT, were evaluated in thyroid samples. In the PTC group, the data showed that MLH1 and MGMT were methylated in 44% and 64% of the cases, respectively. A similar pattern was observed in the FTC subgroup. No significant difference was observed between benign and FTC or PTC samples (Table 2). *p values compared against benign group. We also evaluated the relationship between promoter methylation and presence of specific mutations. For this analysis, we defined negative as those samples that proved to be negative for the panel of mutations, i.e., BRAF V600E, NRAS Q61R, IDH1 mutations and RET/PTC rearrangements. The negative subgroup comprises 19 of 70 (27%) PTC and 6 of 12 (50%) FTC samples. Samples harbouring more than one mutation (n = 10) were also excluded from statistical analysis. Although not significant, our data showed a decrease in MLH1 expression in samples harbouring BRAF V600E mutations (Figure 1A), RET/PTC rearrangements (Figure 1B), or transitions (Figure 1C). However, when samples with point mutations were grouped together, MLH1 expression was significantly decreased (p = 0.019; Figure 1D). No significant relationship was found between MGMT expression levels and the mutations. 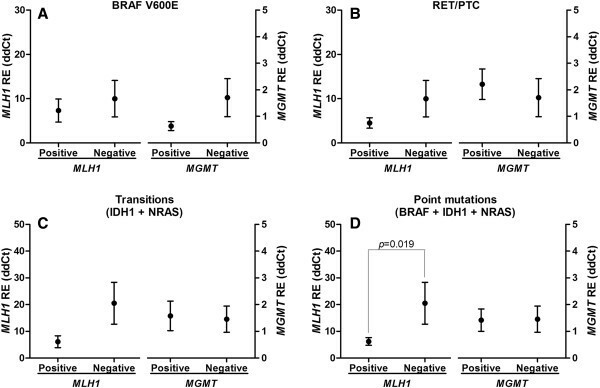 Relative expression of MLH1 and MGMT in thyroid cancer samples according to mutational status of BRAF V600E (A), RET/PTC rearrangements (B), samples with IDH1 and NRAS transitions (C) or all samples with point mutations (D). Analyses of BRAF V600E mutations and RET/PTC were only performed for the PTC group, as these alterations are exclusive of this subtype. The negative group comprises only the samples without any of the alterations investigated. The symbols represent the mean, and the lines represent the standard error. The left Y-axis indicates the relative expression values of MLH1, and the right Y-axis indicates the relative expression values of MGMT. The p values are indicated if statistically significant. Despite the decreased expression observed, BRAF V600E-mutated samples had a hypomethylated pattern (p = 0.048). No significant relationship was found between MGMT methylation and the mutations (Table 3). * Analysis performed only in the PTC group. Negative group comprises only samples without any of the alterations investigated. Microsatellite instability analysis showed that 37% of the samples were positive for the D17S250 microsatellite instability marker, 34% for D2S346, 19% for D2S123, 12% for D11S912, 10% for BAT40, 10% for BAT26 and 2% for BAT25. Our data showed that 84% (59/70) of PTC samples had MSI. Among them, 64% (38/59) showed a MSI-H pattern and 46% (21/59) a MSI-L pattern. In the FTC group, 92% (11/12) of samples had MSI; 82% (9/11) were MSI-H and 18% (2/11) were MSI-L. In the benign group, no MSI-H was observed; all MSI positive samples (43% - 6/14) were MSI-L. Therefore, a significant difference in the MSI patterns between PTC and FTC compared with the benign group was observed (Table 4). Furthermore, no relationship was observed between MSI and any mutations (Table 5). * p values compared against the benign group. Regarding the effects of MLH1 and MGMT expression on MSI status, our data showed that the MSI phenotype correlated with down-regulation of MLH1 among patients with benign lesions compared with samples with MSS. Similar results were also observed for MGMT (Figure 2A and 2B). As the FTC group only had one sample with MSS, the statistical analysis could not be performed. Relative expression of MLH1 (A) and MGMT (B) in samples according to MSI and MSS pattern and histological subtype. The symbols represent the mean, and the lines represent the standard error. Although MSI status was not correlated with MLH1 expression levels in PTC, we found a marginal association between MSI and MLH1 methylation in the PTC group (p = 0.079). The methylation pattern of MGMT was associated with MSI in PTC samples (p = 0.01; Table 6). *p = 0.079 compared with the benign group; **p = 0.01. DNA repair mechanisms are essential for correcting post-replication errors. Impaired DNA repair is related to increases in mutation frequency, genomic instability and cell death. Aberrant DNA methylation and expression silencing is an important molecular alteration that is commonly detected in DNA repair genes in different types of cancer. Because MLH1 promoter methylation was previously associated with MSI and a BRAF V600E mutation , we tested the methylation status of MLH1 in a series of thyroid tumours and correlated them with mutational status and MSI. Additionally, a previous study has reported that MGMT hypermethylation was associated with transitions in IDH1 and RAS. Thus, we assessed whether the presence of IDH1 and RAS mutations is associated with MGMT methylation and/or loss of MGMT expression. Our study did not find significant differences in MLH1 and MGMT promoter methylation between the groups studied. This result suggests that mechanisms other than DNA methylation in the CpG island studied, e.g., methylation in other CpG islands, miRNAs and histone modifications, could be acting to silence the expression of the genes studied. The putative relationships between MLH1 expression and BRAF V600E, RET/PTC and IDH1 genetic alterations were evaluated. Our results showed diminished expression of MLH1 in patients harbouring BRAF V600E mutations, RET/PTC rearrangements and transitions (IDH1 and NRAS). Although not significant, this result suggests a trend toward significance. Studying a larger set of samples may provide a more detailed understanding of this issue. In fact, when all samples with point mutations were grouped together, a significant association was found. To the best of our knowledge, this evidence is the first to indicate that the down-regulation of MHL1 is related to BRAF V600E mutations, RET/PTC rearrangements and transitions (IDH1 and NRAS) in patients with thyroid carcinoma. We did not find a significant correlation between MGMT hypermethylation and/or loss of expression and its association with mutational status. A larger sample set may be necessary to reject the hypothesis that MGMT hypermethylation or loss of expression is not associated with IDH1 or RAS mutations. Interestingly, the primary mutation found in IDH1 brain tumours was at codon R132, while in thyroid carcinomas, non-R132 mutations were found . Microsatellite instability is a hallmark of the mismatch repair (MMR) deficiency [21, 22]. Thus, to evaluate the MSI status of the thyroid samples, we used seven markers. The microsatellite markers demonstrating the highest frequency of MSI were D17S250, D2S346 and D2S123. The lowest frequencies were observed for BAT40, BAT26 and BAT25. Furthermore, mononucleotide markers (BAT40, BAT26 and BAT25) present the lowest frequency of instability among all microsatellite markers tested for both benign and malignant thyroid tumours [23, 24]. A significant relationship between MSI status (MSI-H) and histological subtypes was demonstrated in both PTC and FTC, and a higher frequency was found in patients with FTC. MSI is related to malignancy and the clinicopathological factors that indicate poor prognosis [23–25]. MSI does not act as an early event in thyroid tumourigenesis, but MSI is instead involved in tumour progression , indicating that MSI might play an important role in thyroid carcinogenesis, as previously described [23–26]. We evaluated the relationship between each mutation and the MSI pattern. Although the BRAF V600E mutation has been associated with sporadic MSI-H colorectal cancers , no relationship was found between BRAF V600E mutations, RET/PTC rearrangements and transitions (IDH1 and NRAS) and MSI status. Although it has been suggested that in thyroid tumours, MSI is an important indicator of defects in the MMR system , the data presented in this study showed no relationship between MLH1 expression and MSI status. In addition, a previous study on colorectal cancer showed that methylation of another DNA repair gene, MGMT, is also linked to MSI [22, 29]. In thyroid samples, our data showed a relationship between promoter methylation and MSI phenotype. Taking these facts into consideration, the results of this study allow us to conclude that low expression of MLH1 is associated with BRAF V600E mutations and RET/PTC rearrangements and transitions (IDH1 and NRAS) in patients with thyroid carcinoma. Furthermore, a significant relationship between MSI status and histological subtypes was found. JS made significant contributions to the conception and design of the study, acquisition of data, analysis and interpretation of data, drafting and critical revision of the manuscript, statistical analysis, and supervision. She had full access to all of the data in the study and takes responsibility for the integrity of the data and the accuracy of the data analysis. AB made significant contributions to the acquisition of data, critical revision of the manuscript, statistical analysis, and technical support. JC made significant contributions to the acquisition of data, critical revision of the manuscript, and administrative support. MR made significant contributions to the analysis and interpretation of data, critical revision of the manuscript, and statistical analysis. All authors read and approved the final manuscript.